We’ll cut to the chase. Both are very worthwhile espressos. In fact, both are easily some of the finest espressos served in this country without a doubt. They’re both more nuanced, woody, and with spectacular cremas that only the true barista masters and highest caliber of beans can accomplish. Espresso of this level demands everything to be sharp as a razor blade– the beans, barista, the machine, the timing, the temperature, the pull…the difference between good and bad espresso is as minute as the victory by barely a nose Saturday at the Preakness for I’ll Have Another. Victrola has it all. It is the complete espresso, coffee shop experience. Sunshine streams in mid day, bathing those outside at the few sidewalk tables, writers clawing away at their laptops, or of course, the gesturing Italian standing at the bar giving his approval of this sensual espresso from beans roasted in the back of the room behind a glass window. The espresso is more robust than any I have found. Slick, creamy, it resembles more a shot of the most soulful dark drinking chocolate. It demands to be savored with the respect of a reserve Kentucky bourbon. Vivace is a touch behind, but this is like picking Astaire vs Kelly. Vivace has both a stand along Broadway and a cafe called Vivace at Brix, both on the other side of the first part of Capitol Hill from Victrola. The Brix cafe is a tad impersonal, a little too glossy for a long, lingering meeting or study session. The people watching here, though is primo. The espresso shot will be one of the smallest you’ll ever find (which is a surprise knowing how big an espresso shot already is…), yet it is so concentrated with some oak and cherry notes, and a terrific crema that you undoubtedly want to hit the bar for a second. Oh by the way, both shots are just $2. 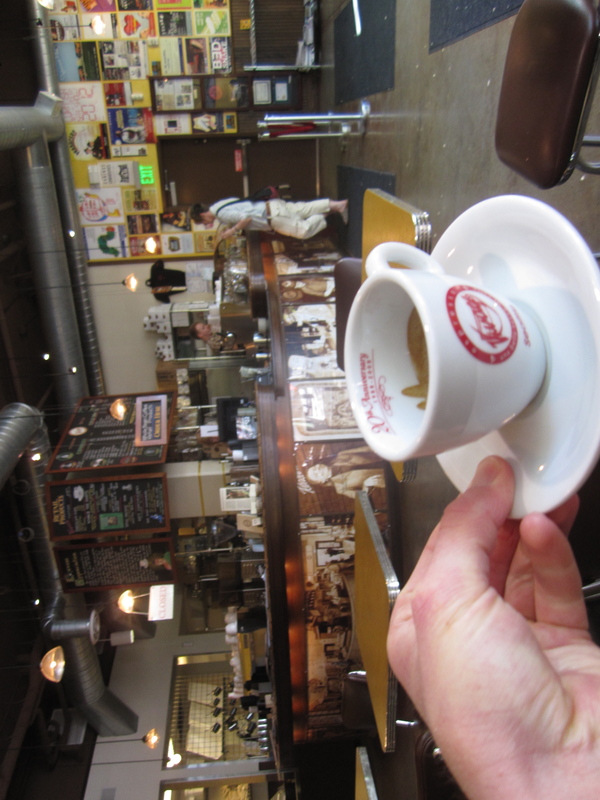 Why are inferior shots from non coffee roasting cafés often $3 or more? One of those inferior cafés would be, you guessed it, the original Starbucks location by the Pike Place Market. The salmon tossing fishmongers are the main tourist attraction. The original Starbucks is definitely second. Lines are always out the door, except when I waltzed right in at 5pm on a Sunday afternoon. The staff is unusually bubbly and happy to see you for a Starbucks, very shocking given the number of people who just walk in to take pictures. I asked about the quality of the espresso since the one other Starbucks espresso I have had tasted like the Cuyahoga River. The pointed to the sleek La Marzocco machine in back (the barista stand is its own little center in the rear of the café unlike most Starbucks where the barista is next door to the cashier), the obligatory machine at any respectable 2012 coffee shop. 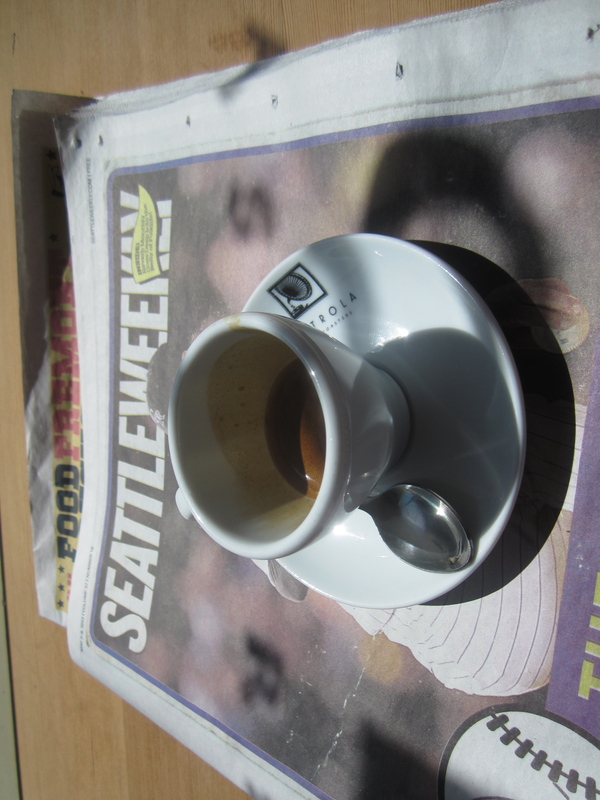 The espresso itself had a pleasant crema, but lacked much of any tasting note. It was harmless. It was also served in a paper cup– Starbucks isn’t onto the whole drink out of a glass concept yet. 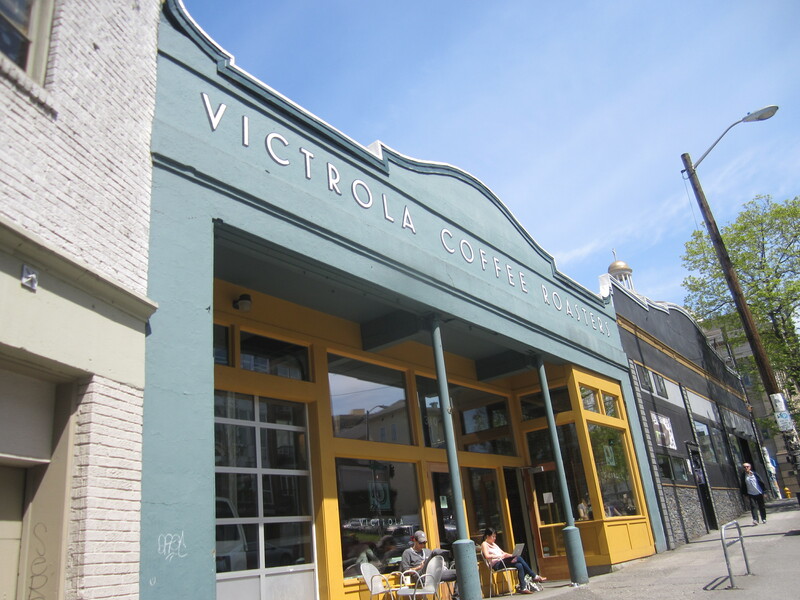 Unlike Portland, there are very few coffee roasters in the city outside Victrola and Vivace. 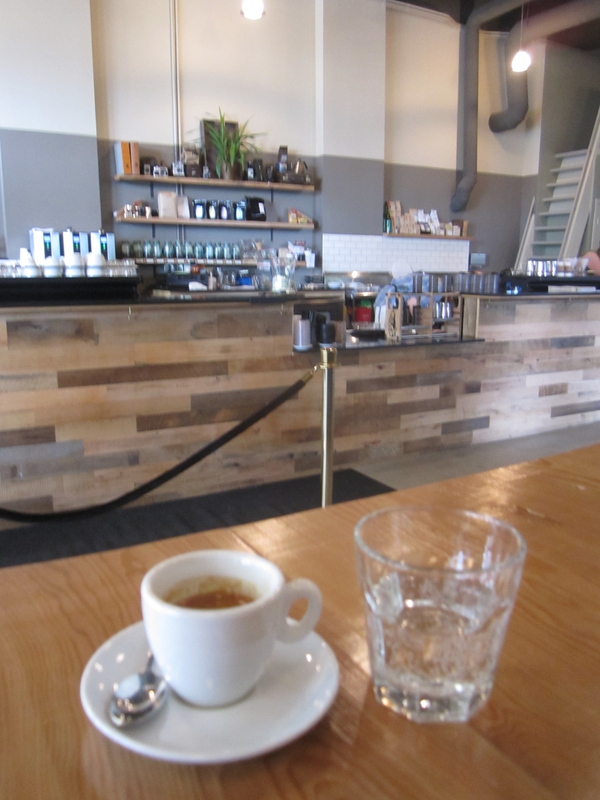 Milstead & Co. in Fremont is a stellar, serene café, where I very much enjoyed a spot on espresso from Heart Roasters in Portland. The premier coffee experience outside of Victrola, can be found way up near Green Lake, in the neighborhood of Greenwood at Neptune. Neptune’s espresso blend is a special one from Victrola, explaining a bit the similarity in woody flavor, superb crema, and a deep, lingering aroma. The single origin espresso blend from Kenya was even more distinct, with a real to the point taste reminding me of eucalyptus. Dan Baumfeld, the owner and lead barista, is one of the country’s champion baristas, a wizard at detecting the faintest flavors in espresso shots. He travels the country, wide awake, judging barista competitions, and has created an invaluable guide to the noteworthy coffee shops nationwide. Be sure to use the site! 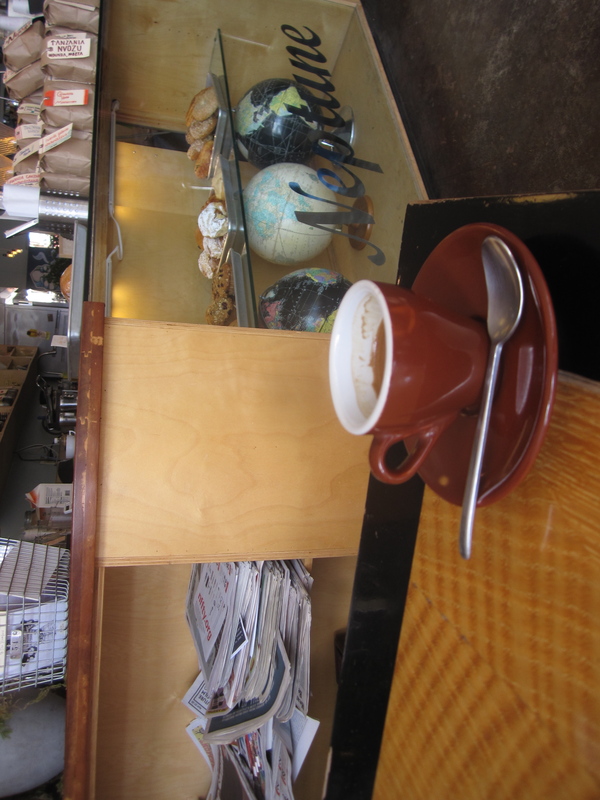 Espresso at Milstead & Co. The Fremont Coffee Co. does indeed roast their own beans, but their more watery, weaky espresso sadly was more in line with Starbucks than the others. The cute cottage house for the café is exceptionally welcoming, though. Starbucks may rule supreme across the country with its massive empire. 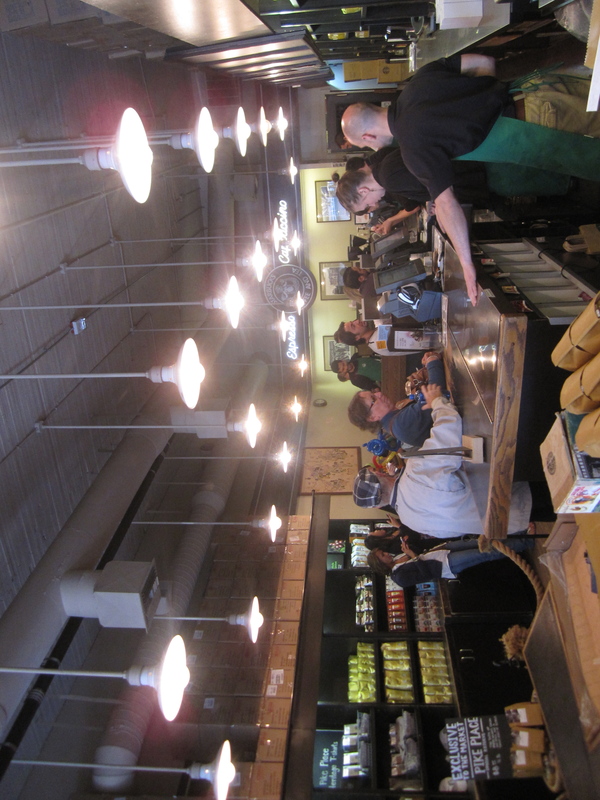 It’s the little cafés with a lot of heart that produce the quality though, especially in the city Starbucks calls home. This entry was posted on May 22, 2012 by trevsbistro. It was filed under Insight, Seattle .